This ‘ how to start a blog to make money ‘ post will outline the steps you need to follow if you want to make money blogging. Last year I took a leap of faith and decided to learn how to start a blog to make money on the side. This wasn’t my first time attempting to blog, in fact, I had created a blog 2 years prior and I failed, miserably. But, last year, I created a great blog, one that now makes me actual money each and every month. Before I show you the steps you need to follow to learn how to start a blog to make money, read these important tips. 1. Do not start a blog that is too expensive to maintain. I started my blog expensively. It cost me $40+ monthly to keep it up and running and that was way too much for me to maintain at the time. 2. Do not choose blog topics that you don’t care about. You might end up creating content that is less than ‘interesting’ and your readers might not read it. If you don’t get readers, your blog has a high chance of failing. 4. Learn how to properly make money from your blog. I did not know how to monetize my blog effectively. Other than the monetization strategies such as Google Adsense Ads and Amazon Associates Program, I had no clue of how to monetize my blog and actually make money from it. 5. Do not believe people who would lead you to believe that blogging doesn’t take much time and effort. When I started my first blog, I convinced myself (after hearing others say so) that I was going to have my blog set up in a day and start making $1000+ in my first month as a blogger. Do not get me wrong, this does happen in some rare cases, however, generally a blog takes about 1 week to a month to get fully set up and you can expect to make about $1000+ by month 4 or later, and way more (I’m talking full-time income plus some) by the end of your first year as a blogger. 6. Learn to Market on social media- My fav is Pinterest. When I started my first blog back in 2014, I had no clue Pinterest was a way to get blog visitors. This time around, Pinterest has been driving thousands of visitors to my blog each month. In this post, I will show you exactly how to start a profitable blog in 6 steps so that you can avoid the mistakes I made with my first blog. Keep in mind, starting your blog is just the beginning. You still have to spend some time setting up your blog so that you have a nice looking and cohesive blog when you start to promote it on the internet. Don’t worry though, I have some awesome resources linked below, that will help walk you through the Blog Set Up Process from start to finish or you could just sign u for my 8-day email course and get EVERYTHING you need to know to start your blog! First An Outline Of How I’ve Been Able To Make Money Blogging. From this point on, I have been making some extra income each month from my blog. Pick a focus for your blog. These are just a few examples of what you can blog about. The opportunities are endless and will ultimately be up to you and what you want your blog to be focused on. You want this domain name to be as catchy as possible but also simple to spell and remember. Here are a few guidelines to follow when thinking about a domain name for your blog. Choose a catchy name. Something that visitors will remember. If you can, make it short. When I started my blog in September 2016, I choose the domain name (sheblogsaboutjobs.com). This domain was not very brandable or memorable. 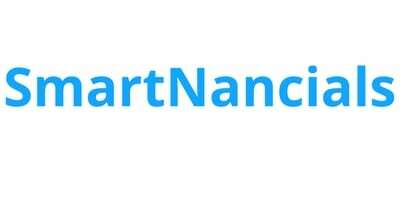 I have since changed it to smartnancials.com which I like a lot better. If you can’t brainstorm a name that you like, you can also consider using your name. For instance Dawngreene.com. I’ve said all this, but please don’t over-complicate this step. As nice as it is to have a great domain, it doesn’t really matter all that much. Your blog will still be profitable if you create great content that people really enjoy and can benefit or learn from. For instance, I made money from my blog when it was called sheblogsaboutjobs.com and I still continue to make money from my blog now that it’s called smartnancials.com. The next step to starting a blog is registering your domain. 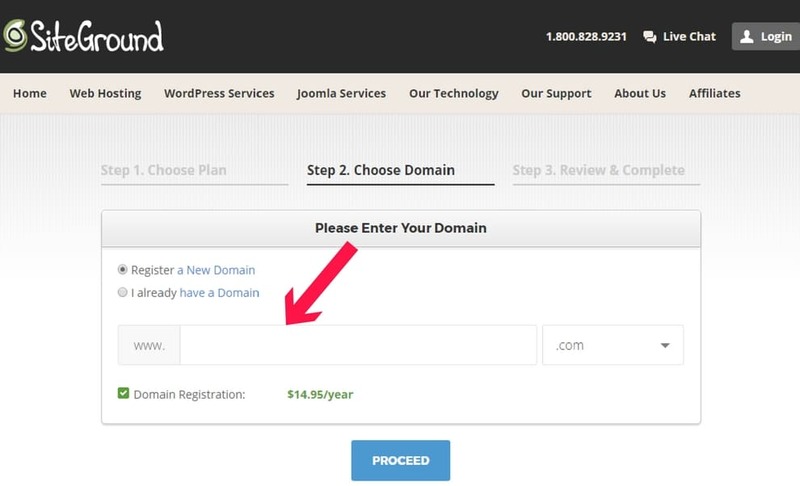 To register a domain, you can simply go to godaddy.com and purchase it for a few bucks. 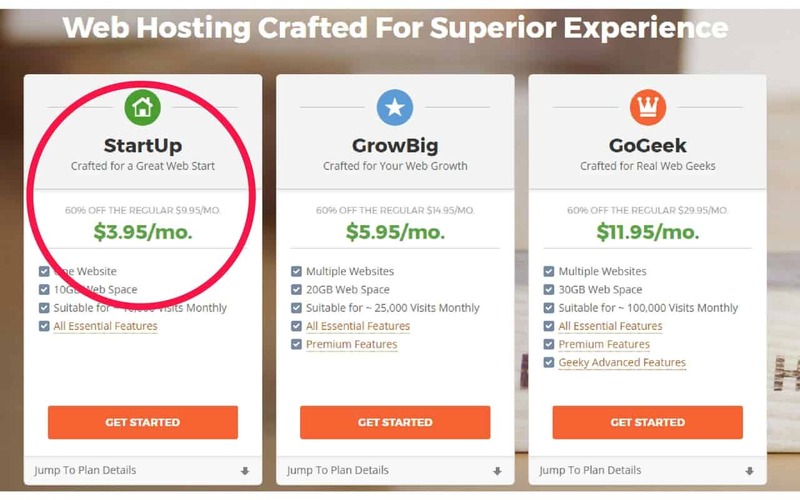 However, I recommend that you get it together with your web hosting package as I will show you in the step below. Doing it this way will make the process of getting your domain name and hosting package 100% easier for you. P.S. Sometimes the domain name that you really want might not be available, in cases like this, you simply brainstorm another domain that is either close to your first choice or describes your blog focus well. You can also consider using your name since this might more than likely be available. This may sound a bit confusing, but all it means to you is that a web hosting package will allow your blog to become visible on the internet so that people can access it. Every blog needs a host and there are tons of them online. They usually cost anywhere between $1-$20 monthly (billed yearly). 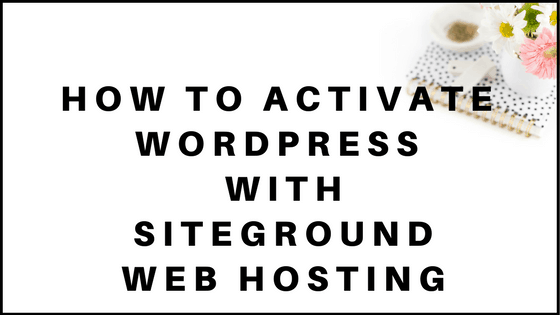 I recommend that you use Siteground web hosting to start your blog. 3. Add the domain name you brainstormed in the given space as seen in the image below. After logging into your WordPress dashboard, you will notice that your blog is mostly empty, save for a few default placeholders. 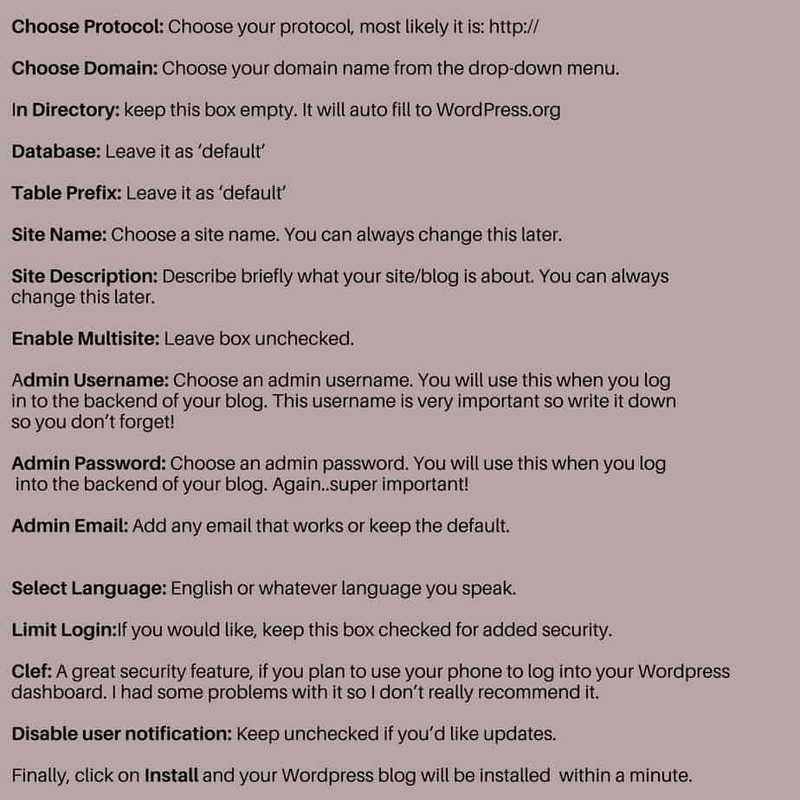 I have created a checklist below which outlines all the mandatory steps to set up your blog. Each item on the checklist links to a helpful resource that will help guide you through each step. ☐ Create Your First Few Posts: Write 3 or more great posts that set the tone for content you will have on your blog. Now that you’ve learned how to start a blog to make money, I would love to share some of my favorite resources that I have used to learn how I can earn money from my blog each. 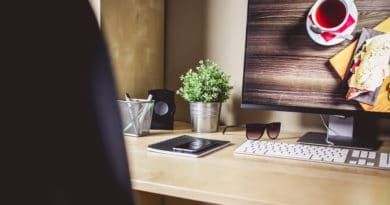 These important resources that can help take your blog from just launched to successful and making money in a few months. 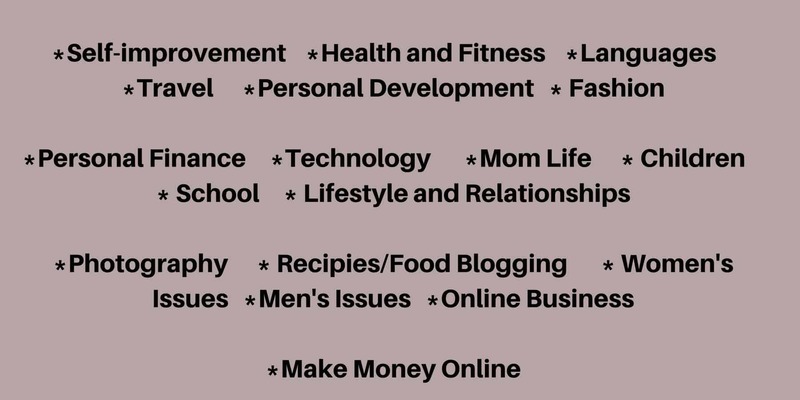 One is an e-course by Michelle, a blogger who has taken her blog from $0-$100,000 per month. She shares her secrets in her course called Making Sense Of Affiliate Marketing. You should read more on this e-course if you want to make money blogging. The other is a course I recently purchased which has helped me go from struggling for page views each month (12,000 per month) to over 45,000 page views per month in just 1 month and 3 weeks and it keeps growing! I know you might be thinking that this doesn’t apply to you since you’re super new to blogging, but, looking back at my results in my first 3 months blogging, I recommend that you get it simply because it will help you promote effectively on Pinterest from the very start of your blog. Indeed, anyone who goes through the trouble of learning how to start a blog to make money needs to understand how important traffic is to the income that you will make from your blog. It’s virtually impossible to make money from your blog if no one is visiting your blog! I wish I had come across this e-course earlier since it would have helped me out in the beginning of my blogging journey. I would have wasted a lot less time working almost fruitlessly on Pinterest as I did in my first 3 months of blogging. The course costs $47 and you should definitely check it out if you want to start promoting your blog the right way on Pinterest. You can check out the course here. 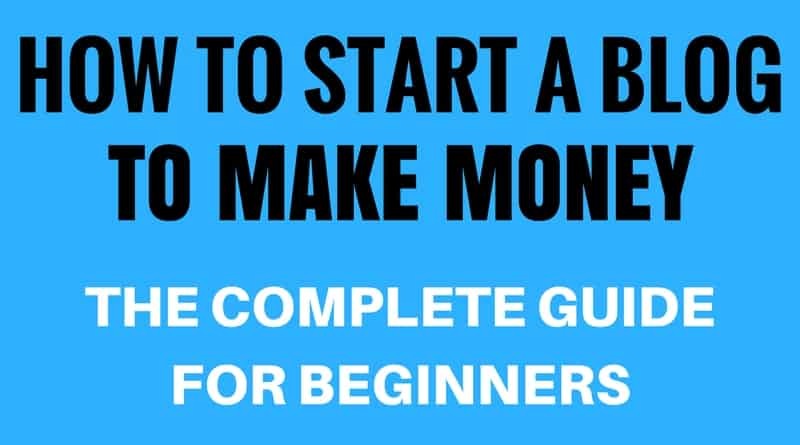 I hope this guide has adequately explained to you how to start a blog to make money from the internet. Hi Nana! You’re welcome and I’m really happy I was able to help you out!